EBook Sales Are (no surprise) Up. Internet Book Sales Are (no surprise) Up. 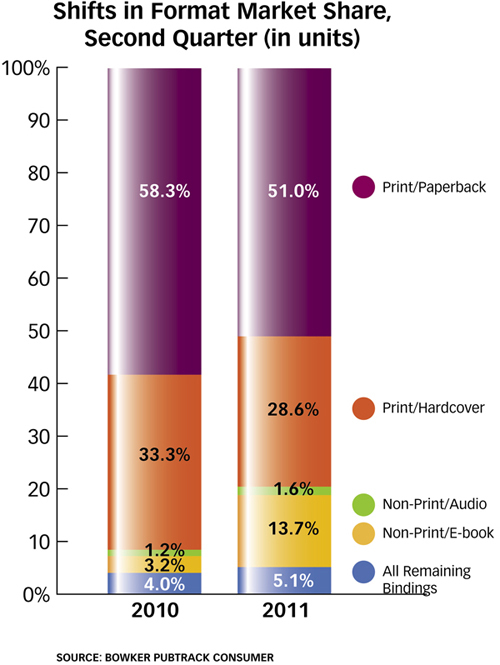 New Statistics have been released by Bowker Pubtrak showing shifts in book sales by Channel and by format. The report compares the second quarter of 2011 to the same period 2010. Not surprisingly Internet book sales are forging ahead. A lot of it was due to the closing of Borders. But book sales have been shifting online for some time. And similarly unit sales of ebooks are continuing to increase exponentially. First let’s take a look at the channels. That’s a fancy word for where books are being sold. As you can see by the chart, e-commerce has increased from 27.6% to 37%. Borders’ closing certainly has a lot to do with this. Even with Borders open, last year Amazon barely beat out Barnes and Noble for the first time as the largest bookseller. We don’t know whether BN will come roaring back this year. After all, they stand to pick up the most from Borders’ closing. But Amazon, being the largest purveyor of e-books, may very well increase its market share as the largest bookstore. Looking at some of the other channels, book clubs are becoming more marginal. When I first entered the book business in the 1970s, book clubs were a huge presence. Now they are insignificant. At that time one of the largest venues for selling books was department stores. As you can see in the graph, department stores have pretty much discontinued selling books, replaced by ladys’ handbags and designer beauty products. Chain store sales have declined from 30.6% to 27.3%. That is a lot less than I would have predicted, given the fact that Border’s disappeared. The only significant chains that are left are Barnes and Noble and Books-a-Million. I would have to assume that a lot of the Borders’ business has been picked up by these two companies. Moving down to the independent stores, some nice news here. Market share has increased from 4.5% to 5%. It is still distressingly low. But indies are also benefiting from Borders’ closing. Mass merchants and warehouse clubs have declined slightly. That would be stores like Costco, Wal-Mart, and Target. There was a time back in the 90s when Wal-Mart bragged that it would soon be the largest purveyor of books. They expected to sell 25% of all books. It doesn’t look like it will happen. Ok, now let’s look at how sales of book formats have been changing. Again these figures are for the 2nd quarter 2011 compared to the same period in 2010. The largest format is still paperbacks, both trade and mass market. But it has declined from 58.3% to 51%. Hardbacks too have declined significantly from 33.3% to 28.6%. And as expected ebooks are continuing to increase exponentially growing from 3.2% to 13.7%. 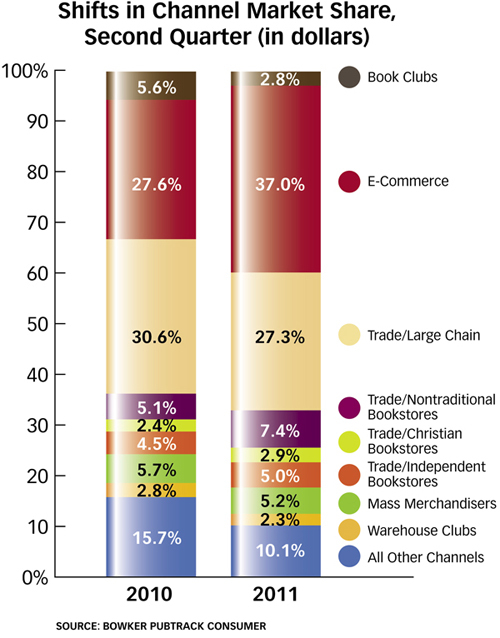 R. R. Bowker announced its annual market share analysis of outlets for trade book sales. Here is the break down by percentages. There are some interesting and surprising numbers here. First of all there are quite a few venues that presumably aren’t broken out. These include but are not limited to: airport stores, libraries, school stores, book fairs, gift stores, other Internet outlets, Christian book stores, book clubs, mail order outlets, special and premium sales and of course self-published titles. That ‘s a lot. I’m sorry they didn’t break these down. It would leave me to question some of these statistics. Before you ask, I will tell you that these numbers don’t include e-books, which in 2010 became a significant component of trade book sales. Some publishers have reported that e-book unit sales in 2010 account for about 10% of their total trade sales. The most surprising number above is that Barnes and Noble (retail and on-line) continues to be the largest outlet for trade sales in America, far surpassing Amazon.com. On the other hand, these figures indicate that most of the growth in retail is coming from Amazon. I would imagine that given Amazon’s dominance in e-book sales, if e-books had been included, Amazon would show a larger percentage of market share. Of course, Amazon has chosen not to break out their e-book sales. They don’t even break out their book sales. It is treated as part of sales for their media division. Another reason to question the robustness of these statistics. The other surprising statistic that should be alarming to all book lovers is that the market share of independent stores is only 3.5%. It’s nice to see that their share is increasing though. If you ask anyone in publishing, they will tell you that independent stores continue to be the heart and soul of bookselling. But sadly, their role has declined to a small niche. Books that might otherwise have been invisible to book buyers found their audience through the passionate advocacy of independent booksellers. I would ask: who is replacing them? Who is providing the passion in this business? I think I know the answer to that question. And I think that answer is pretty sad. Borders Books declined slightly. This statistic also leads me to question the robustness of this analysis. Borders is the sick man of the book business. They have been pushed into bankruptcy this year and have already closed several hundred stores. There is a big question whether they will ever emerge from bankruptcy. Publishers seem unwilling to extend credit to them. There is a good chance that they won’t show up on next year’s list at all. For awhile, Wal-mart was the fastest growing segment of the retail book business. There were a lot of people saying that they expected Wal-mart to be selling 25% of all books in the near future. This didn’t come to pass. Wal-mart’s market share declined substantially, more than any other market segment, more even than Borders. The Borders Collapse: What Does It Mean? Most publishers aren’t talking, but rumor is that most of the majors won’t be shipping books to Borders even on a cash with order basis. Borders has been buying books from the distributor, Ingram Book Company, but one can only guess at the stringent credit requirements that Ingram is imposing. In their filings, Borders has claimed an option to close an additional 76 – 136 stores on top of the 200 that were announced (and posted on Scribd) this morning. There are still a lot of questions worth considering as Borders’ bankruptcy progresses. To what extent will Borders’ sales migrate to online booksellers, to Barnes and Noble, to big box merchants, and to independent stores. I have spoken to several independent booksellers located near Borders. They seem to think that this will give them a new lease on life. Probably the more important question is whether Borders’ Chapter 11 filing for reorganization will fail and cause the company to file a Chapter 7 bankruptcy that will govern the liquidation of the remainder of the company. Bankruptcy lawyers will tell you that many of these efforts to reorganize fail, because suppliers are unwilling to risk working with the reorganized company. This certainly seems to be the case with book publishers at this time. And finally one must ask how many book sales lost by Borders will simply disappear? As the Publishers Lunch article says, conventional wisdom is that 50% of sales will migrate to other venues, while 50% will be lost. However a back-of–the-envelope analysis of book sales since the beginning of the year would indicate that the impact of Borders’ closings will be less dramatic. There already is a lot of Monday morning quarterbacking trying to explain the Borders collapse. In my opinion, the answer is pretty simple. Borders was the victim of changing buying habits by book customers. The growth of online bookselling has been hurting brick and mortar store sales for years now. E-book sales have increased exponentially this year to the point where they constitute about 10% of trade book sales. Borders has failed to adopt to this new environment and was not in a position to exploit the e-book phenomenon. Their web presence is weak. For some time, they had even allowed Amazon.com to manage their website! Finally the economy has hit all retailers including booksellers very hard. Borders was already in a weak position going into the Great Recession. And the downturn for them has been devastating. All of this added to a long list of foolish management decisions over the years has made Borders the sick man of the book business. It is too bad. When Borders first began expanding 20 years ago, they were considered a class act, a company much more attuned to the culture of books than Barnes and Noble. Ultimately this changed, and has not been the case for a long time. To be sure, Barnes and Noble is struggling with many of the same stresses as Borders, but they seem to be more successful at adopting to the changes going on in the book business. At least for now. Borders had a reputation of overpaying for leases. (When I was planning my bookstore in the Union Square district, my real estate agent told me that the nearby Borders on Post Street was paying rent in excess of $1,500,000 per year. That store is scheduled to close). Barnes and Noble has announced that they are going to be reducing the square footage devoted to books in their stores and selling more sideline items. But they, too, have been closing underperforming stores. B&N early on has focused much more on Internet sales, believing that this was the future of bookselling. Barnesandnoble.com is second to Amazon in online book sales, but it is a distant second. Unlike Borders, Barnes and Noble has embraced e-books. Their e-book reader, The Nook, has gotten excellent reviews and accounted for the fact that this December Barnes and Noble had its best sales ever. However if you discount the sales of the Nook, the picture is not so rosy. Ultimately the fall of Borders is linked to the seismic changes that are going on in book publishing now. How this will sort itself out in the future is unclear. But one thing that seems certain is that people are continuing to read books even if they exist in new formats and new packages. I guess this is the good news. Sales for the 4th quarter which includes the all-important holiday season were down 19%, a sign that Borders condition was deteriorating. The list of 200 stores scheduled to be closed has not been officially released but was leaked on Scribd. I’ll try to do some more post as information is released. Borders’ troubles are deepening. They just announced that they would not be paying vendors in January and will not be paying their rent as well. A little knowledge of bankruptcy law is always helpful. Borders’ unwillingness or inability to pay rent is a very dark sign. Usually landlords are the first to get paid. (Vendors are usually the last.) As the unpaid creditors line up, it increases the chances of some of them going to court and forcing an involuntary bankruptcy. To simplify a complex legal issue, as few as 3 creditors can petition the courts to initiate a bankruptcy hearing. As this is being written, Borders’ stock is down 9 cents. This doesn’t sound like much, but when the price is at 76 cents per share, it translates to being down 10%. From a practical perspective, anyone who was continuing to ship goods to Borders has likely learned their lesson, and it increases the likelihood of a bankruptcy filing–whether forced or voluntary–if the bookseller does not meet the many conditions of its new financing arrangement shortly. The impact of not paying rent in particular may impose a timetable on how much longer Borders has to plead for concessions before seeking court protection. While we have no direct knowledge of their lease conditions and potential grace periods for payment of rent, and laws do vary from state to state, commercial landlords are generally able to petition for eviction within about two weeks after provided for non-payment deadlines. There has been a lot of talk in the publishing trade and in the financial pages of the major media about the future of Borders Books and Music. 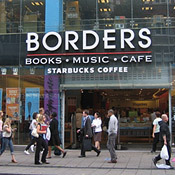 Borders is the second largest bricks and mortar bookseller (after Barnes & Noble). There is a very good article by Pete Osnos, publisher of Public Affairs Books, in the January Atlantic Monthly. It looks like Borders is very close to filing for bankruptcy. Their sales have been declining in double digits for several years. Their stores are down to 674 from 877 last year and many more scheduled to close in the next few months. After Christmas, Borders announced that it was “temporarily” suspending payment to publishers on the $455,000,000 that they currently owe. This is a staggering amount of money that is at risk to publishers who are suffering their own financial problems in a weak economy. Borders has been meeting with the publishers in New York promising financial “restructuring” and making rosy predictions that they have made many times before. They have asked the publishers to convert their Borders receivables into loans to the company. Publishers are obviously reluctant to do this. A loan to a bankrupt company is a worthless asset. Border’s is begging publishers to restore credit to them and to make concessions to help the company stay in business (and presumably to protect the publishers’ receivables). Barnes and Noble, who is understandably less troubled by Border’s financial problems, has stated that any special terms granted to Borders by publishers must also be granted to them and to independent stores as well. Borders still accounts for 8.5% of all trade books sold. Barnes and Noble and Amazon are both about 17%. So the uncertainty of Borders future is becoming a logistical, as well as a financial, nightmare. Publishers are having difficulty scheduling author appearances and planning for in- store promotions without knowing the future of the chain. The story of Borders has elements of a Greek tragedy but partakes of a fair amount of farce as well. Borders originated as an independent store in Ann Arbor, Michigan. It was a lot like Cody’s. In the 1980s, it developed a sophisticated inventory control system. In 1991, Borders was bought by the mass merchant, K-Mart. They began following the lead of Barnes and Noble opening 40,000 square feet superstores throughout the country. At that time Borders seemed like the class act. They had a real book culture. Barnes and Noble seemed more like they were treating books like merchandise. But as the years wore on, things changed. Borders brought in a lot of grocery store executives who brought their (how shall we say) unique vision to the company. As Barnes and Noble became a more robust business, Borders lost its way. They started going heavily in music cd’s not long before music started being downloadable. They treated Internet bookselling as an afterthought. And now their Internet site is run by Amazon, their chief competitor, in what must be one of the most bizarre relationships in the history of modern retailing. Meanwhile, Borders isn’t paying its bills. Publishers are not shipping books, and the shelves of the giant Borders superstores are starting to look threadbare. It’s a downward spiral difficult to turn around. If Border’s closes, there will be some opportunities for Barnes and Noble and Amazon to pick up a portion of the business and significant relief from competitive pressure for some independent stores. But it is going to be a heavy financial hit for publishers of all sizes, and how it will all play out in the world of books is anybody’s guess. This is a continuation of John Marlow’s interview with me for his Self Editing blog. John is a novelist and script writer and editor. His blog focuses on people writing for movies. JRM: A number of agents and agencies are now rebranding themselves as “literary management” companies. Does this, in your opinion, represent a fundamental change in the representation business-a shift, perhaps, toward the Hollywood model where writers often retain both agent and manager? Andy Ross: In the book trade, so far, distinguishing between “agent” and “literary management” is like distinguishing between “used car” and “preowned car.” Different words for the same thing. The real distinction is between agents who do manage client’s careers and those who just flip contracts. The former are preferable to the latter. Andy Ross: Yes. I guess my simple answer is that, in the book world, good literary agents manage their clients’ careers as well as get them contracts. Bad agents just flip contracts. JRM: What’s the industry-wide average or typical advance for a book by a first-time writer, and how is that paid out? Feel free to break that down into categories, or to qualify it any way you like. Andy Ross: I can’t make any generalization about typical advances. But I can say that advances have dramatically decreased in the last few years. It is not unusual to get an offer of a $50,000 advance from a major publisher, for a book that may very well be a lead title. Any agent will tell you that today, $50,000 is a very good advance. Five years ago, that same book might have garnered three times that amount. You read about seven-figure advances, but really these are for the big celebrities. Advances get split into payments. Two, three, and even four. Smaller advances are often paid in two parts, one on signing and one on delivery and acceptance of the manuscript. Larger advances will have an additional payment at the time of publication. JRM: Moving more toward the classic Hollywood step deal. While we’re talking left coast—any thoughts on books with film or other crossover potential, and how that potential affects the likelihood or ultimate price of a sale? 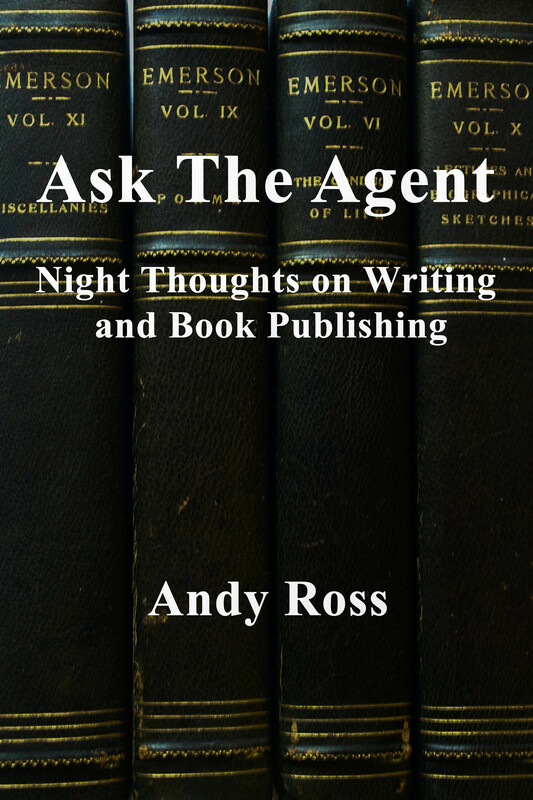 Andy Ross: Most good agents will try to reserve the rights for movie/tv/performance for the author. So a publisher won’t get a piece of that action. But in general, a movie helps the sale of a book. There are a lot of deals for “options” for movies, which give the production company the right to exercise an exclusive option for a given period of time. A lot of these deals aren’t worth much money. There are very few options that end up getting made into movies. JRM: For readers who may not know the score, I feel compelled to say here that, while this is absolutely true of most options–typically those by lesser-known companies and individuals—it’s also true that many options pay more than a typical book advance, even if the film is never made. In which case, the author gets to keep the money-and option the work again, or sell it. Also, some options involve the optioning party doing a significant amount of work to develop, improve, or adapt the work being optioned. Andy Ross: That is certainly true. Options, like advances, come in all shapes and sizes. JRM: What industry trends do you think writers should be aware of right now—what’s changing, and where is it taking us? Andy Ross: The big topic of conversation right now is electronic publishing. It is growing exponentially, and will continue to do so as more consumers buy reading devices. The reading experience with e-books has become pretty good now. I believe that this is the future of book publishing, as far as anyone can really predict the future in this fast-changing world. I think this will have tragic consequences for community-based bookstores and for the communities they serve. I don’t think online bookselling is ever going to be able to recreate the ineffable joy and excitement of shopping at a real bookstore. I don’t think that e-books will necessarily change the way people write or the content of what they write. It is a neutral medium, just as a blank piece of paper is a neutral medium. Of course the more substantial and, to my mind, more troubling trend is the reduction of reader attention span due to the Internet. Reading requires patience and time, and a kind of commitment from the reader that is missing when one is simply surfing the net. And, of course, the culture of celebrity is driving bigger and bigger sales to fewer and fewer titles. These are very troubling trends, indeed. JRM: Going back to your comment about the pleasures of shopping at brick-and-mortar stores, I have to agree. But there’s another issue in play here. Once upon a time, the big chains drove the little independents out of business. Now the online behemoths are putting the hurt on the chains. Amazon has driven Barnes & Noble to the auction block, Borders has already gone under in Britain and was teetering on the brink last year in the U.S. The same thing is happening with dvd rentals: Netflix has driven Blockbuster into bankruptcy. This would seem to bode well for indies, particularly small or niche stores with lower overhead—where the people working there actually know and care about the books they’re selling. But will customers be willing to pay more for that superior service and personal connection, when they can in most cases order the same thing online, for less? Andy Ross: That is a very good point. My wife works at an independent store, Book Passage in Marin County, north of San Francisco. I used to be an independent bookseller, and I have a lot of friends who own independent stores. People in publishing and book lovers everywhere think of indies as the heart and soul of the book business. Barnes & Noble is still a very robust company. It sells about the same number of books as Amazon. But they are closing a lot of stores and using more space for non-book items. In other words, they are having to make very significant adjustments to accommodate the brave new world of publishing. Borders is a corporate basket case. They seem to be trying to shrink their way into profitability. Not a good sign. And yes, you are right that smaller independents have some important advantages. 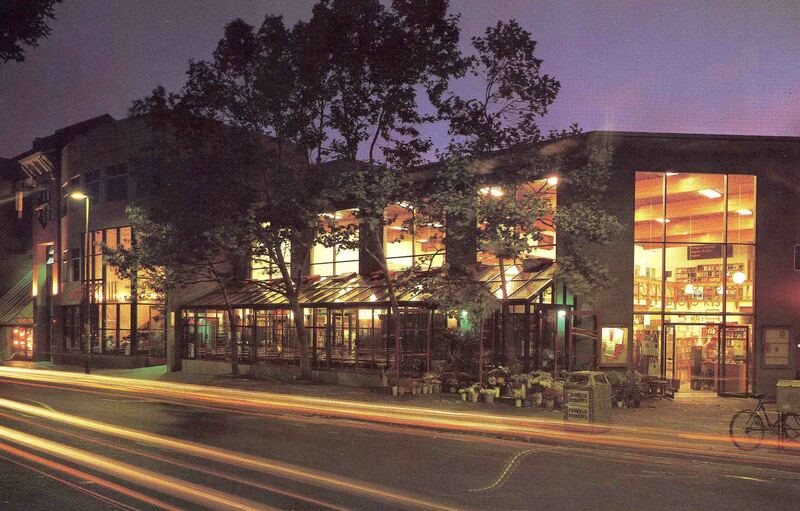 They have low overhead and provide the kind of bookstore experience that is matchless. But unless they can find a way to adapt to the e-book revolution, their future will be in doubt. JRM: What does your experience at Cody’s tell you? Andy Ross: Cody’s was a large independent store and was probably a victim of history. The heyday of independent stores was in the 1980’s, before the chains started opening up superstores everywhere. Business began declining in the ’90s. And at the end of that decade we began facing extremely robust competition from Amazon.com. Cody’s had a very high overhead and faced eroding sales. JRM: What do you like most about working with writers? Andy Ross: I have enormous admiration for the vocation as well as the profession of writing. I think a lot about what Anne Lamott said in Bird by Bird. She advised the writer to stop worrying about getting published. Writing opens you to the world and makes you a better and wiser person. Getting published does none of this. And seldom brings wealth or fame. I have said elsewhere in my blog [link] that the work of the writer reminds me of the final magnificent sentences of Albert Camus’ Myth of Sisyphus. Something to the effect that: “the journey itself is enough to fill a man’s heart.” Nothing to my mind is a more eloquent expression about the courage it takes to be a writer.